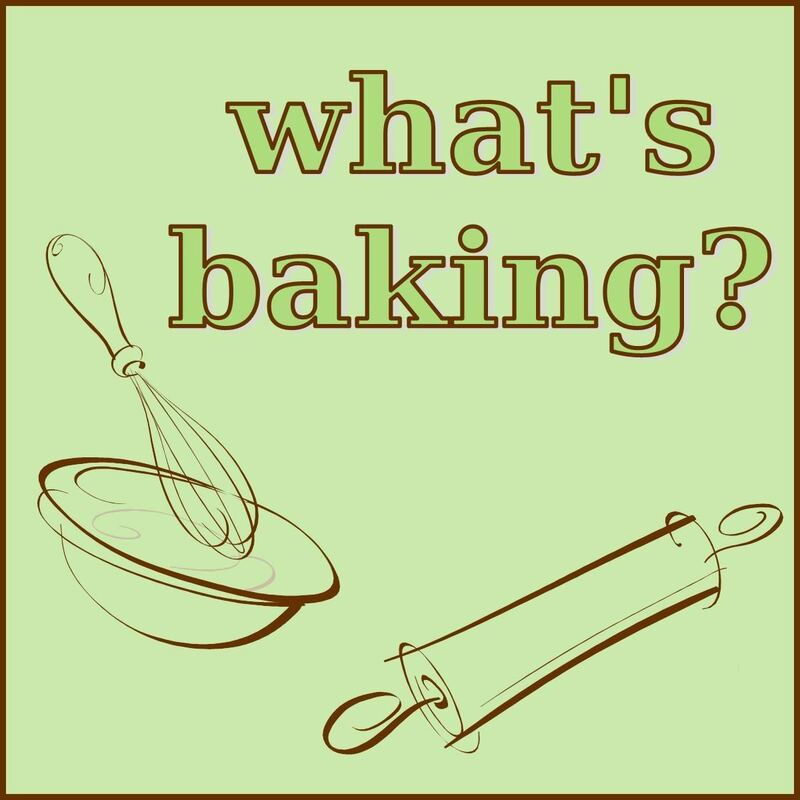 This month’s theme for What’s Baking was “family favourite”. I already shared my family favourite Chocolate Cake recipe, CH’s favourite Banana Bread, and my personal favourite the Strawberry Tarts, so I had to think a little about what I wanted to bake this month. 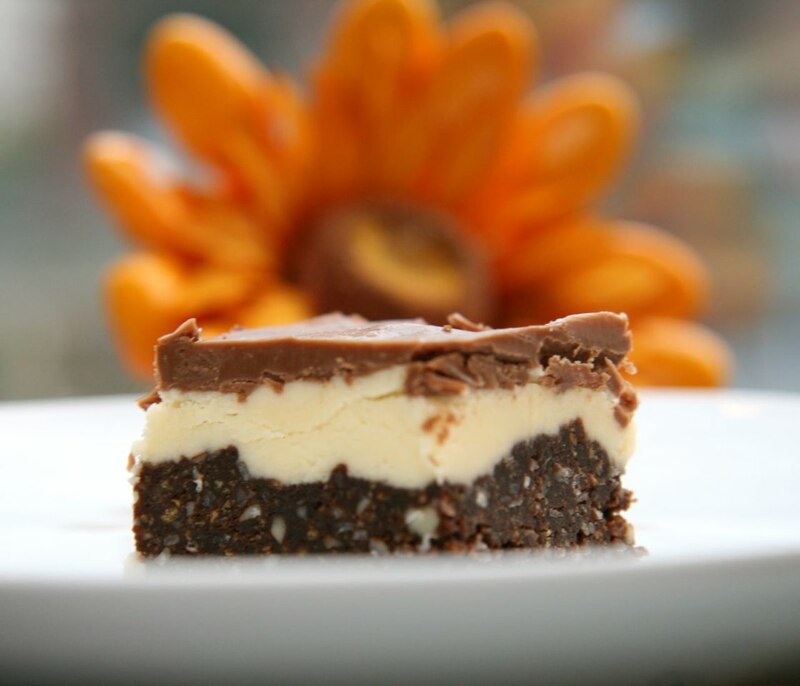 It didn’t take long as I started thinking about my family, particularly my Mom and remembered one dessert that she loves and totally reminds me of her – Nanaimo Bars! 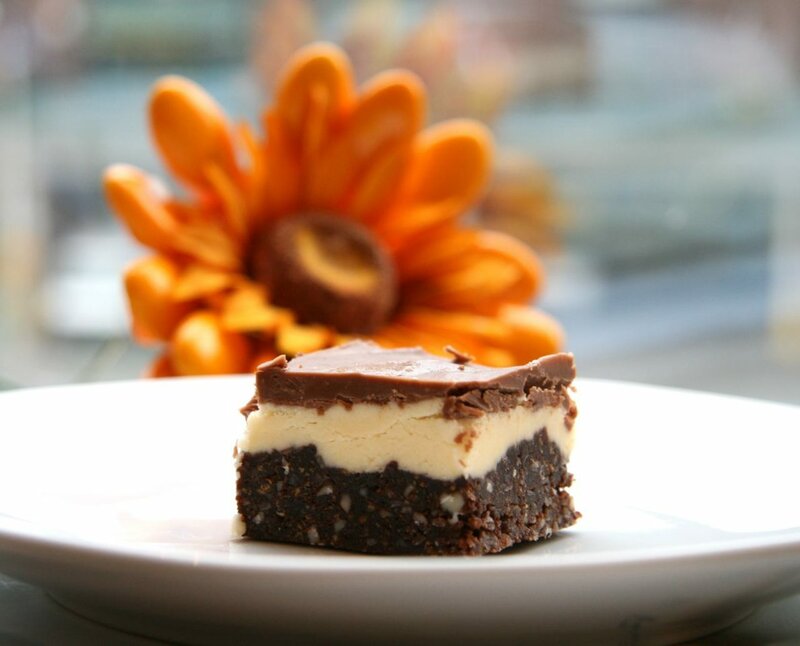 Now, the other thing about Nanaimo Bars, is that they apparently originate from Nanaimo, British Columbia, Canada – my home province (and hence their name)! I grew up just across the water from Naniamo, and visited there often for hockey tournaments etc. So, not only are these bars a family favourite, they originate close to home. It was meant to be! As another random fact, they are actually called “Canadian Bars” in Australia, too cute! I have never made them from scratch before, and was surprised at how easy they were. Three layers, no oven-baking required, no crazy ingredients, sounds like a perfect recipe to me! The recipe below made quite a few, so they are now safely in the freezer, ready to be enjoyed whenever we are in need of a treat, or whenever guests’ pop over for a last minute visit/dessert. In a small saucepan, over medium-low heat, melt the butter. Add the sugar and cocoa powder to the saucepan and whisk thoroughly until smooth and well incorporated. Remove the saucepan from the heat, and then gradually whisk in the beaten egg. Return the saucepan to low heat and cook, stirring constantly, until the mixture thickens (1 – 2 minutes). Remove from the saucepan from heat. Stir in crumbs, coconut, and almonds. Press firmly and evenly into an ungreased 8″ x 8″ pan. Place the butter, cream, custard powder, and icing sugar in a large bowl and using a hand-mixer, beat the mixture until light and fluffy (it will take a few minutes, and will appear to form balls of mush, but keep going!). Spread the mixture over bottom crust layer. In a small saucepan, over low heat, melt the chocolate and butter until smooth and glossy. Allow the mixture to cool slightly (room temperature). Once cool, but still liquid, pour over second layer, spread out into an even layer. 2 weeks since my last post..whoops, sorry guys. Time flies when you are having fun, you know, starting work, settling into a routine, seeing your best friend get married (Congrats Bart!) etc. In any event, I have been cooking up a storm this week, and I even did my meal plan last weekend, so the JBean Cuisine kitchen is back in full-steam. This month’s recipe swap theme was “Tailgating Recipes”. It is clear that us Canadians do not have the love or tradition of tailgating that the US football fans do. But, after reading all the posts’ about rituals, get-togethers, the food and just the general fun, I am looking for a US college team to adopt me, just so I can participate in the tailgating fun. I actually asked CH if we could go down to a US college game this season, just to experience it and tailgate (feel free to leave a comment with what school/team/game we should check-out, anything within driving distance of Toronto is fair game – so that means NY, MI – any Ann Arbor fans?!). However, with all this tailgating excitement, I have to be 100% completely honest; the recipe I received in the swap is one that would never appear on our table. I am not trying to be harsh or snooty, it just isn’t a recipe I’d ever make at home, and when I showed it to CH, he said he’d never eat it. Although the point of the recipe swap is to try new things, this recipe definitely needed tweaking in order for us to try it, and I don’t mean any offense to whoever submitted it, or to those that enjoy this recipe. It just isn’t to our taste and I didn’t want to waste all of those ingredients on a recipe I knew we wouldn’t like. So, what I did do, was take inspiration from the original recipe and turned it into something we REALLY enjoyed. I had a batch of Annie’s pizza dough in my freezer and lots of fresh vegetables in the fridge, so this is how my Mediterranean inspired calzones were created. I had never made calzones before, and CH even questioned me attempting them…along the lines of “do you even know how?” Well, I proved him wrong…they came out perfect: golden crispy crust, gooey, cheesy filling, freshness from the veggies and a slightly spicy undertone from the siracha, banana peppers and red chili flakes. All in all, it was a great combination. We loved the fun spin on the normal pizza dough recipe. I will definitely be experimenting with calzones in the future, and perfecting my folding skills (which left a little to be desired). A special thanks goes out to Sarah of A Taste of Home, who is the amazing organizer of all these swaps. Be sure to check-out her blog and see the round-up post to get inspired. Preheat your oven to 500° F. Place your pizza stone in the oven and heat for at least 30 minutes. In a large skillet over medium-high, heat the olive oil for a minute or two. Add the chopped onion to the pan and sauté for 3-4 minutes, until translucent. Add the peppers to the pan and continue sautéing for another 5 minutes. Mix in the cooked chicken, tomatoes, tomato paste, sriracha, banana peppers, oregano, basil, red pepper flaxes and a dash of S&P. Cook the mixture over low-heat for another 5-10 minutes, until warmed through and the mixture is thick (and all of the excess moisture has evaporated). Meanwhile, divide pizza dough into quarters (4 pieces) on a lightly floured work surface and roll out each piece of dough into rounds approximately 4-5 inches in diameter. Transfer each piece of dough to a piece of parchment paper, or place all dough rounds on one large piece of parchment paper, the size of the pizza stone (I cooked mine in batches, just to accommodate different schedules!). Sprinkle one half of each piece of dough round with a small amount of shredded mozzarella, leaving a thin border around the edge. Divide the chicken and vegetable mixture between the dough rounds. Then, top the mixture with more mozzarella cheese and finally top with a generous sprinkle of the feta cheese. Fold the dough over on top of the filling, pinching the edges of the dough together to seal (I pinched the sides and then used a fork to ensure it was sealed). 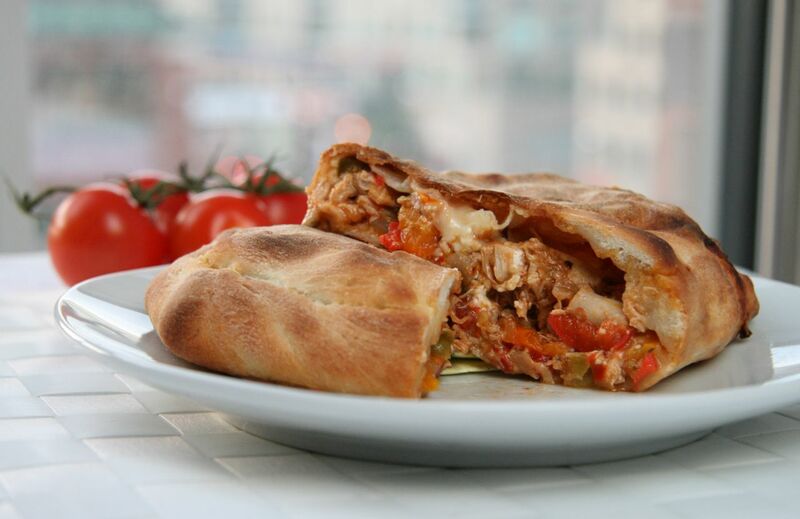 Transfer the calzones to the heated pizza stone and bake until crispy and brown, about 8 – 10 minutes. Remove from oven, let cool for a few minutes, and then dive-in. Recipe inspiration taken from FoodNetwork. 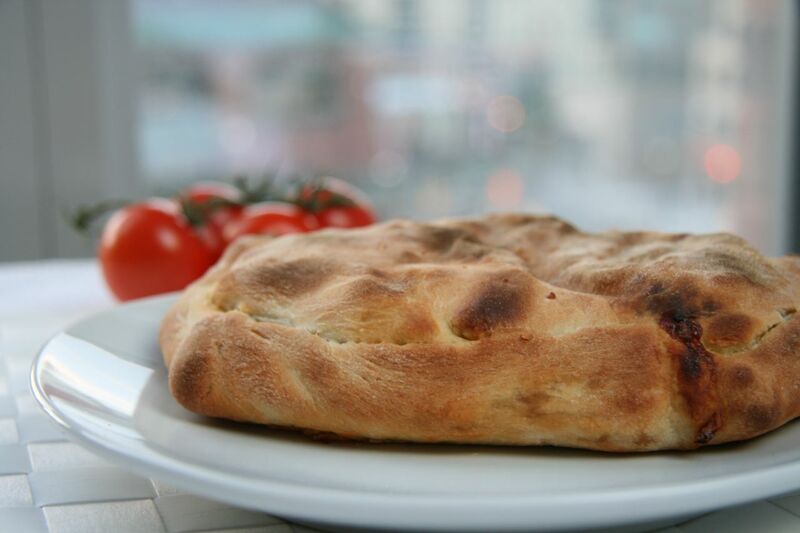 Calzone inspiration/basic directions taken from Annie’s Eats. This recipe is one I’ve had in my back pocket for a while, one that is cherished, brings back really great memories with friends (Hi Caits!) and has been passed along to almost everyone who has enjoyed them at our home. 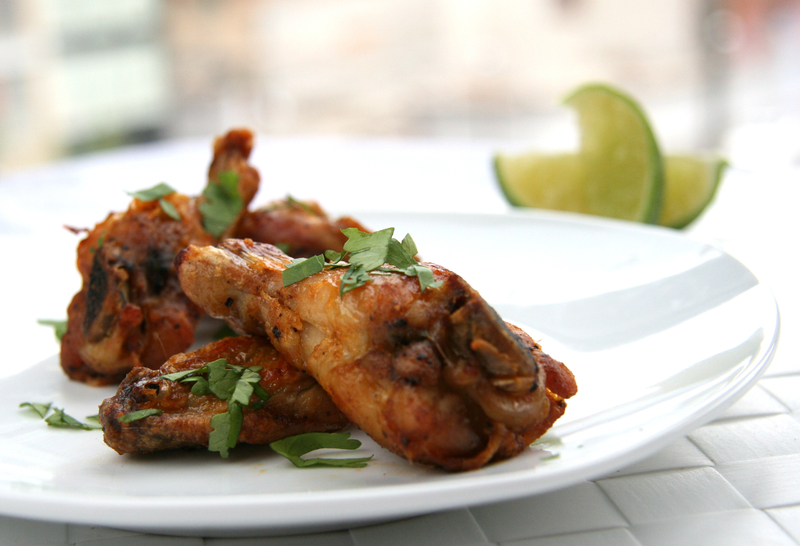 The answer as to why this recipe is such a success is a simple one: who doesn’t like chicken wings? 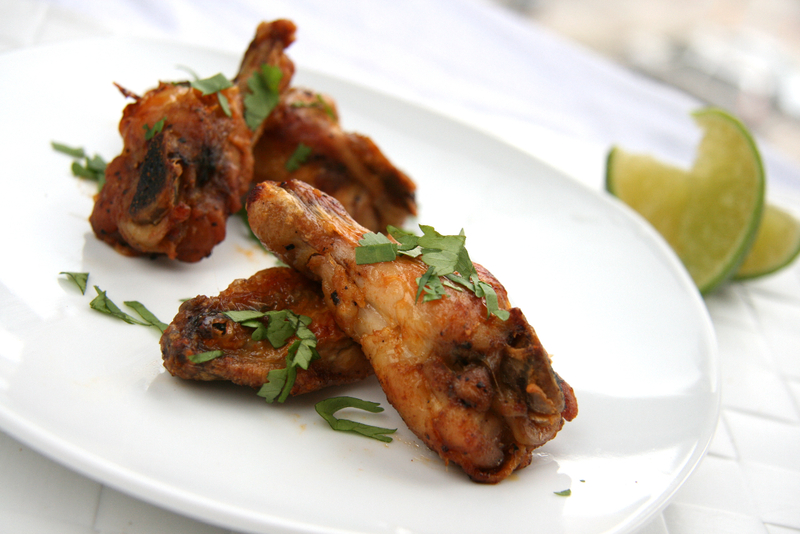 Albeit, delicious, juicy and crispy baked chicken wings (which haven’t been battered or fried), all of which are tossed in a sauce that is the perfect balance of sweet, spicy, sour and salty. These wings are absolutely devoured any time they are served, so be sure to make a few extra (or save a few for the cook in the kitchen)! They make a great appetizer, they are a great party food, but CH and I also love them for a weeknight dinner, with a simple green salad on the side. Remove the chicken wings from the package and pat them really dry. Place the wings in a large bowl, drizzle with olive oil (be generous! ), season well with salt and pepper and toss to coat. Spread the wings onto a baking sheet and roast them in the oven for about 25 minutes, or until the skin gets crisp and brown, and the meat is tender. Flip the wings about half-way through cooking to ensure that both sides get golden brown. While the chicken wings are cooking, place the butter, red curry paste, honey, zest of the lime and soy sauce into a small saucepan. Warm the mixture over low heat, whisking frequently to incorporate all of the ingredients. Season with salt and pepper and keep warm until the wings are cooked. 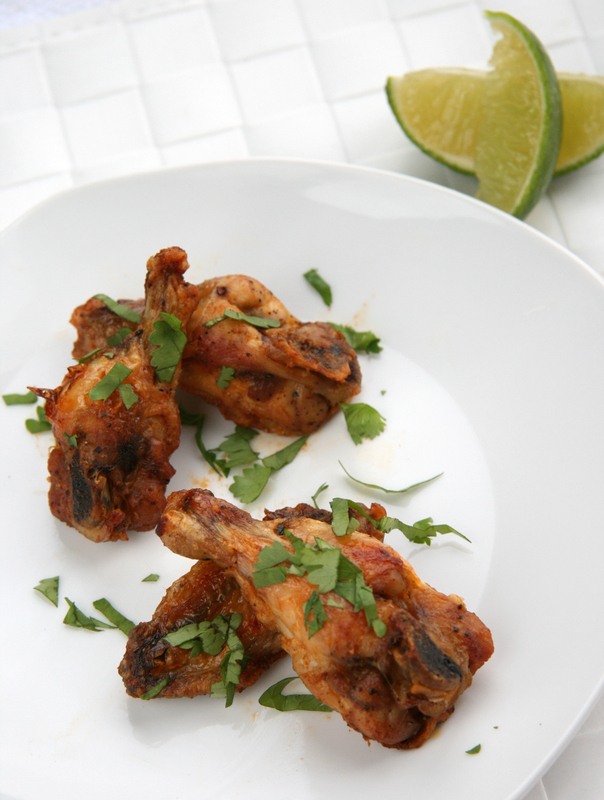 When the chicken wings are ready, scrape the curry lime butter into a large (clean!) bowl. Take the wings out of the oven and immediately add them to the bowl with the curry butter mixture. Squeeze the juice of the lime over the wings. Give the bowl a good toss and you’re done. Garnish with cilantro.